The two books by Catherine McIlwaine issued in conjunction with the current Tolkien exhibition at the Bodleian Library, Tolkien: Maker of Middle-earth and Tolkien Treasures, contain previously unpublished reproductions of Tolkien’s art, other reproductions not previously published in colour, and enlarged details which reveal intricate features of some of Tolkien’s paintings and drawings. Rather than try to indicate in our online Addenda and Corrigenda where these new reproductions would be inserted into our existing list of Tolkien’s published art, in the second volume of our J.R.R. Tolkien Companion and Guide: Reader’s Guide (2nd edn. 2017), we have made a new, revised version of the list and posted it on our website. In the process, we took the opportunity to correct a few errors of formatting and to emend some inconsistencies of form, presentation, and classification, as well as our introductory note. We are also compiling a list of pages, or parts of pages, of Tolkien’s literary manuscripts and typescripts which have been reproduced in various sources. When the Bodleian Library asked us last year to write an essay on Tolkien as a visual artist for Tolkien: Maker of Middle-earth, the catalogue of the Library’s new exhibition, we were happy to do so. 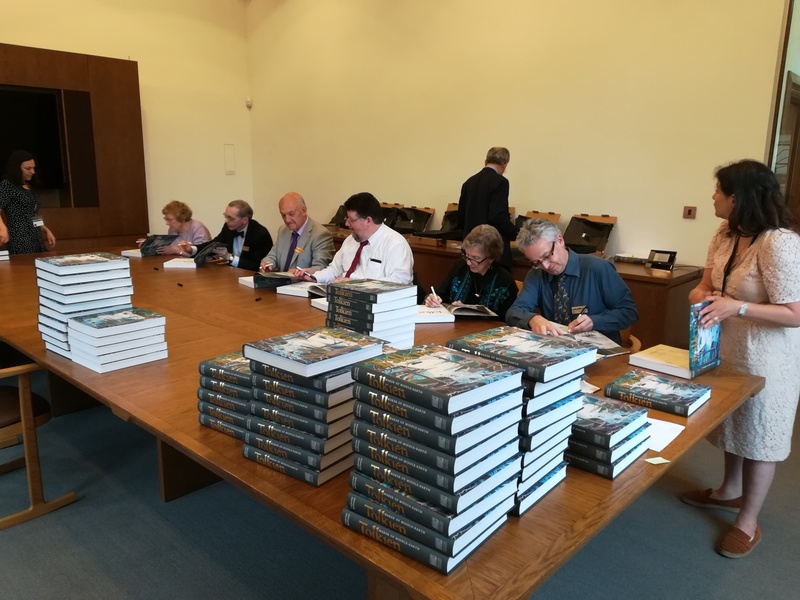 We were also happy to be invited to a special preview, reception, and dinner at the Bodleian on 31 May, prior to the general opening on 1 June. This gave us a very good excuse for another visit to England, after a gap of two years. We arranged to stay nine nights in London and seven in Oxford, and to do some further research among the Tolkien papers in the Bodleian. We drove to Boston on Sunday, 20 May, and stayed over night at the Courtyard Logan Airport. We left our car there on a ‘park and fly’ plan. On Monday the 21st we woke early for British Airways’ morning flight. Since we were flying business class, we were able to relax before boarding in a newly renovated lounge. For some reason, boarding was delayed, then haphazard, with too many passengers trying to settle into their seats at once. Departure was also delayed in turn, by about forty minutes, and this seems to have put the flight attendants out of sync. They forgot to ask (or to ask us, at least) about tea or coffee after brunch, which was served unusually late, or about drinks at any time, and Christina had to ask for some things twice. There weren’t enough meals of all kinds of the brunch listed on the menu to go around, nor had any amenity kits been loaded for our cabin. A tapas plate was offered as refreshments only just before landing, in a rush. Also, apparently no amenity kits had been loaded for our cabin, and the aging entertainment system had to be rebooted. One expects better from business class, and we’ve usually had it from BA. Once off the plane at Heathrow, around 7.00 p.m. London time, we breezed through Immigration and Customs – we now know that Wayne, as her spouse, goes with Christina to a desk for U.K. citizens – did not have to wait long for our luggage to appear, and soon caught a Heathrow Express train to Paddington station. From there we took a taxi to the Rosewood, our hotel in High Holborn. We began our first full day in London with breakfast at the Holborn Dining Room, adjacent to the hotel. We ate there on alternate mornings – the restaurant is pleasant, but limited in dishes we like (mostly eggs and toast) – at other times picking up something from one of the small supermarkets nearby or eating at Pret a Manger (or simply Pret), which has branches everywhere. By 10.00 we were at the British Library to see their exhibition James Cook: The Voyages, 2018 being the 250th anniversary of the first of Captain Cook’s three voyages to the Pacific. The display was well designed, but featured perhaps too many of the same kind of object – after a while, manuscript journals begin to look alike. Apart from the expected catalogue and books on Cook, the Library shop had a disappointing selection: it seems to have fewer scholarly books and more books and gifts aimed at tourists each time we visit. After a sandwich at the Pret across the street from the Library, we went to the Illustration Cupboard in St James’s, which was showing illustrations by Angela Barrett for The Emperor’s New Clothes, and then to Hatchards in Piccadilly, our favourite general London bookshop. Although Hatchards is owned by Waterstones, it’s a more elegant, dare we say more civilized shop, and its buyers are more eclectic in what they choose to offer. We had a very pleasant talk with one of the staff about our own publications and about Tolkien publishing in general. As usual, we found a few titles to note for later purchase, but bought there a copy of the catalogue for the Edward Bawden exhibition we would be seeing at Dulwich on Sunday. Finally, we visited Beetles, the art dealer in St James’s, to pick up the latest catalogues of their more or less annual exhibitions of British and American illustration. We now have almost a shelf of these very useful reference books. Dinner was at the Spaghetti House in Sicilian Avenue near our hotel. This morning we saw Monet and Architecture at the National Gallery. Unusually, the exhibition labels weren’t attached to the walls, but printed in a small booklet to be referred to as wanted. This meant that there were no crowds blocking the view while everyone tried to read a label (rather than look at the art), and with no labels to read (not everyone bothered with the booklet), viewers moved along quickly. We ourselves had read the catalogue of the exhibition in advance, so knew the material. Once finished with Monet, we looked at the general collection in other parts of the Gallery, picking out works we had seen referenced in various books. We also visited the Gallery bookshop, which always has an extensive selection, including titles not seen elsewhere. From the museum in Trafalgar Square we wandered up Charing Cross Road, stopped in Pordes which has good remainders, looked in windows of bookshops in Cecil Court, and browsed for a while in Foyles bookshop, which still impresses us as so much improved over the well-stocked but haphazard place it used to be. We could stay in Foyles only a short time, however, as we had booked a 2.30 lunch at The Ivy in Covent Garden, one of our favourite London restaurants and a popular place for actors and businesspeople. Afterward, we returned to finish looking in Foyles, where we found a first printing of the paperback edition of Tolkien’s Beren and Lúthien (others had reported finding only later printings, so we had been checking stock in every shop). Since we had had a late and substantial lunch, we wanted only a snack in the evening. On Thursday morning we walked around the corner in Holborn to catch up on the restoration of Sir John Soane’s Museum. Christina had worked at the Soane for more than twenty years as its Librarian, and it was where we had our wedding reception in 1994. Soane (1753–1837) was an important architect whose former home in Lincoln’s Inn Fields is preserved, along with his fascinating collections of art and artefacts (Hogarths and Canalettos, but also an Egyptian sarcophagus), as Britain’s smallest national museum. It has become very popular, and was crowded when we visited, though it was still early and not the weekend. In its shop Christina picked up some of the Museum’s most recent publications, which are always well-written and attractive. From the Soane we went to Sloane Square to pick up a shuttle bus to the Antiquarian Booksellers Association fair in Battersea Park. Wayne had his librarian’s hat on for a couple of hours as we browsed the booths and he spoke with dealers. At one he bought for the Chapin Library a presentation copy of William Wilberforce’s 1823 Appeal to abolish slavery throughout the British colonies. We found nothing for ourselves at the fair, or at Judd’s Books in Bloomsbury where we went later that afternoon. After resting at our hotel, we had dinner in an Italian restaurant with our friends Brian Sibley (co-writer of the 1981 BBC Radio dramatization of The Lord of the Rings) and his partner David Weeks. We spent most of Friday morning at Leighton House, the former home and studio in Holland Park of the eminent Victorian artist Frederic, Lord Leighton (1830–1896). Designed by George Aitchison, the house was built initially in 1865 and later enlarged and remodelled. After Leighton’s death its contents were sold, but the house remained, and in recent years has undergone heroic restoration to return it as close as possible to its appearance in Leighton’s day. Some of its original art and furnishings are there, together with reproductions. There are ambitious plans to further restore the building to what Leighton intended, and to enlarge it for administrative and educational purposes, not an easy task in a residential neighbourhood. We bought two Leighton House publications, one on Leighton’s famous painting Flaming June, which have been interesting to read. From Holland Park we went to High Street Kensington station, and after lunch at a Pret, to West Brompton, the new site of the Provincial Booksellers Fairs Association antiquarian book fair (largely a different set of dealers from those at the ABA fair). There was a kerfuffle before the doors opened, when the fair administrators insisted that bags had to be checked in the cloakroom, even ladies’ handbags, and that anything carried inside the dealers’ room had to be in a smallish clear plastic bag provided. We complied, but after only a few minutes among the booths were annoyed to see later comers carrying handbags, shoulder bags, etc. We considered a few books for ourselves, but thought the prices too high: titles at past PBFA fairs were more moderately priced. Maybe because of the cost of having a booth at the fair, dealers are now pricing almost comparably to those at ABA events, though at PBFA there still tends to be more material at the lower end of the market (such as that now is). Wayne refused to pay £25 for a recent paperback book on artist Edward Bawden, and that was just as well as he found the same title for £10 at Dulwich two days later. From the fair we went to one of our usual stops in Bloomsbury, Skoob Books, where Wayne found a seriously underpriced copy of a book on printer J.H. Mason. Later we had a very good dinner at the Mirror Room restaurant in our hotel (excepting only the lobster bisque, which was less bisque than soup). Today we visited the British Museum to see Rodin and the Art of Ancient Greece, about the influence of Greek art on Rodin’s sculpture and drawing. The display was well designed, and again we prepared by reading the printed catalogue. The Museum was wall to wall with tourists, who now have to pass through an extra layer of security at the Great Russell Street gate. We were pleased to see in the Rodin show two young girls sprawled on the floor with sketchbooks, making drawings of sculpture. In the Museum shop Christina found two slim books about British treasure hoards. In the afternoon we went for the first time to the House of Illustration, founded in 2014 by artist Sir Quentin Blake and dedicated to (what else?) illustration art. The galleries are in a reclaimed industrial building in Granary Square north of St Pancras station. The main exhibition featured the work of Enid Marx (1902–1998), an artist known especially for her pattern designs and a fellow student at the Royal College of Art with other artists Wayne likes, such as Edward Bawden and Eric Ravilious. Rather than eat another lunch at the ubiquitous Pret, we went to the Fortnum & Mason satellite shop in the busy rail station. We were pleasantly surprised at the quality of the food (a lovely hake) and the elegance of the surroundings. Later that afternoon we went to the big Waterstones bookshop in Piccadilly, where we always find a few books to buy or at least to note; Christina found a Soane Museum publication which hadn’t been available in their shop, and Wayne bought a modern sequel to John Buchan’s ‘thrillers’ (such as The Thirty-Nine Steps) which however was not nearly as good as the genuine item. Dinner consisted of snacks in the room, as we had eaten so well for lunch. Up early to catch the Underground and then a bus to the Dulwich Picture Gallery (a Soane-designed building) and its exhibition Edward Bawden. We got there early enough, before the doors opened, to stop briefly in the café. Wayne has admired Bawden’s often quirky art for many years – illustrations, posters, advertising, but also independent watercolours and works he made during World War Two as an official war artist – and collects his books in a modest way. Bawden (1903–1989), and his friend Eric Ravilious, and to a degree other British artists in that circle, have become much better known recently. The Dulwich show, somewhat crowded on a pleasant Sunday, included much that we had not seen before, at least not in the original. Although we had considered having lunch at Dulwich, by midday the café was full, so we returned to central London and went to the main Fortnum & Mason’s shop in Piccadilly. Despite crowds there too – Fortnum’s is a major tourist attraction – we were able to get a nice table at the window in their Gallery restaurant. From Fortnum’s we went across the street to the Royal Academy, but most of their rooms had not yet reopened following renovations, and the shop had minimal stock. As we still had most of the afternoon free, we went to the Tate Gallery in Pimlico, browsed their shop, and looked at the current William Blake display. Dinner was again at the Spaghetti House in Sicilian Avenue. This morning we had tickets for Ocean Liners: Speed and Style at the Victoria & Albert Museum, a splendid show, much more striking than the accompanying book, on the great liners from construction to decoration to the high life of upper-class passengers. This too had a Bawden connection: he had designed a Wedgwood pattern for the Orient Line, which was displayed. Especially effective were a gallery built to look like a promenade deck, with a procession of (simulated) ships passing by on a gigantic screen, and one with a metal floor and low-frequency sound effects, simulating a ship’s engine room. We also booked on the spot for the exhibition Fashioned from Nature, which was divided into a lower gallery, on the use of feathers, fur, etc. in clothing and its effect on animal populations, and an upper gallery, on fashion inspired by nature or designed for sustainability. From the V&A we went to the nearby South Kensington Bookshop, which always has interesting remainders and overstocks. Wayne picked up five books in the areas of art and design. Finally, we had an early dinner at The Good Earth, a pleasant Chinese restaurant in the Brompton Road. On Tuesday morning Wayne was in librarian mode again as we visited the antiquarian bookseller Maggs Bros. in Bedford Square. He found some good Americana for the Chapin Library and explored books related to China for future purchase. We also took in a display of work by the Designer Bookbinders. Lunch was nearby with Helen Dorey, Deputy Director and Inspectress of the Soane Museum, with whom Christina used to work and has remained in touch. By the time we finished our meals and conversation, it was thundering and pouring rain, the only very bad weather we had on our trip. We dove into the Underground station at Holborn and rode the tube to London Bridge station, as we had an afternoon appointment with our editors at HarperCollins. That evening we were able to have an advance look at the new facsimile of the 1937 Hobbit, having been given a copy as the facsimile is accompanied by a booklet containing part of our article on The Hobbit for The J.R.R. Tolkien Companion and Guide. Also in the booklet is the first publication of Tolkien’s 1938 lecture on dragons at the Natural History Museum in Oxford; we had lent our uncorrected transcription to HarperCollins as reference for their own. On returning to our hotel, we decided to eat again at the Mirror Room before devoting the evening to packing for Oxford. This involved fitting into the three bags we brought from home not only our clothes and such, but also 20 new books and other odds and ends (such as an Ocean Liners tote bag and a William Morris-pattern apron) we had acquired in London. Next: Adventures in England, Part Two: Oxford.